Historic markers on the Old Federal Building on First Avenue in Seattle. The Great Seattle Fire started here at the corner of Madison Street. Like other American cities which had major fires in the 1800s, Seattle received a publicity boost from its Great Fire of June 6, 1889. Telegrams went out to other cities’ newspapers telling of the heroic efforts to save property and that no lives were lost in Seattle’s fire. After Seattle’s big fire, city leaders quickly organized to rebuild Seattle’s downtown core on a better street grid and with improved utilities. The city population jumped, swelled by people from all over the USA who came hoping to get jobs in Seattle’s rebuilding program. Out in Barnes County, North Dakota, a young man named Frank Vickers Cook heard about the Great Seattle Fire and thought of the opportunities that might be available to him. He had just one more thing to do before going to Seattle: complete his North Dakota homestead claim and then arrange to sell the land. Frank Vickers Cook’s parents were English immigrants who farmed in New York State, where Frank was born in 1861. In the 1880s Cook went out on his own to North Dakota and filed a land claim, but perhaps he got tired of the backbreaking farm work. When he heard of the Seattle Fire he knew that the city would rebuild and that jobs would be available. Cook arrived in Seattle in 1891 and his first job was as a butcher in a meat market at 2nd & Cherry Streets in the heart of downtown. F.V. Cook soon advanced himself by becoming an agent representing Swift & Co. pork packers & shippers, with offices at 2nd & Jackson Streets. Along with Armour, Cudahy, and Frye-Bruhn, Swift & Co. was a major meat packer & wholesaler in Seattle in the 1890s. Seattle’s population growth after the Fire created a brisk business in meat. In those days more meat was consumed per capita than today, and animal fat (lard) was the only available cooking oil. Cook’s work as a representative of Swift & Co. helped him become familiar with Seattle and the surrounding areas as he visited meat markets & restaurants. His travels gave him a good overview of Seattle’s growth and helped him launch his next career: real estate. Cook made this career change in 1902 at age 40 and he spent the next twenty years working in downtown real estate offices. In 1920 F.V. Cook made his next major life change: he moved from downtown to (the future) Wedgwood. On December 15, 1891 Cook had bought land in what would become Wedgwood, and at the time of his move in 1920 he had not yet developed the property. We can speculate on why Cook bought land so far outside of what was then the city limit of Seattle. We know that land which was farther from downtown was less expensive than close-in areas such as Queen Anne or Capitol Hill. Land in Wedgwood was also less expensive than areas close to natural resources such as Lake Washington. When Cook bought the Wedgwood property in 1891, the University of Washington had not yet moved to its present site, but there was a railroad line which went through the future campus. The train continued eastward to the mill town of Yesler (Laurelhurst) and then north along the shore of Lake Washington. Today’s Burke-Gilman Trail follows the line of this railroad. In addition to the railroad, by the 1890s streetcar lines had been extended to the “suburbs” of Fremont, Green Lake, and Woodland Park. As a land speculator in 1891 when he first bought his Wedgwood property, F.V. Cook might have anticipated that either a railroad or streetcar line would eventually extend out to the property he had purchased and cause it to increase in value. Cook was willing to hold the property and wait, but he waited in vain for streetcars to arrive; the closest they ever got was Ravenna. Wedgwood became more and more of an automobile neighborhood due to the lack of other transportation. Mr. Cook’s house was on NE 75th Street just a few feet west of the intersection of 35th Ave NE. The 7501 35th Ave NE building now takes up the space where Mr. Cook’s house once stood. Finally in 1920, nearly thirty years after he had purchased his Wedgwood property, Mr. Cook built a house for himself at 3412 NE 75th Street. Beginning in the 1920s Mr. Cook’s business listings in the city directory show that he worked out of this house as a local real estate agent. Mr. Cook was not the only realtor to live and work in Wedgwood, but his move there showed that he thought there was enough neighborhood development for him to be able to make a living by selling lots on his own property and by helping others with transactions of buying and selling real estate. By the 1920s the Wedgwood area was not densely populated but it was growing, and there was some commercial development along the main north-south arterial of 35th Avenue NE. In the 8500 block, present site of All that Dance, there was a small store and a gas station owned by Mr. Shauer. In mid-1933 as Prohibition was ending, a beer parlor opened on the present site of the Wedgwood Ale House at 8515 35th Ave NE. A little later, probably in about 1934, the Fiddler’s Inn was founded at its present location, 9219 35th Ave NE. This 1938 tax assessors photo shows Ida’s Inn as of 1938. The site at 7500 35th Ave NE now has five storefronts. Photo courtesy of the Puget Sound Regional Archives, Bellevue, WA. In the 1920s at 7500 35th Ave NE, the northeast corner of the intersection, a two-story building contained an upstairs apartment and a street-level grocery store where customers gave their list to a clerk who filled orders. This was how shopping was done prior to the development of self-service groceries with aisles. After Prohibition ended, in 1934 this store at the northeast corner of the intersection became a beer parlor called Ida’s Inn. But on the northwest corner of the intersection of 75th & 35th which Mr. Cook owned, there was only his house which faced NE 75th Street. Beginning in the 1920s Mr. Cook sold house lots along the 34th Ave NE side of the block, but on the corner of 75th & 35th he continued to hold his property without development. Mr. Cook continued to work as a Wedgwood real estate agent until he was well into his 80s, and he was involved in building and developing the neighborhood. One of Mr. Cook’s activities in the 1940s was to help bring Wedgwood into the City of Seattle. Ravenna had become part of Seattle in 1907 and Laurelhurst in 1910. After that, it wasn’t until the 1940s that other northeast Seattle neighborhoods came into the city limits. This process, called annexation, required petitions signed by twenty percent of the registered voters to bring the issue to ballot, and Mr. Cook took charge of circulating the petitions in Wedgwood. Probably Mr. Cook’s reason for favoring annexation was that coming into the city limits would provide better access to utilities such as water and electric service. This would in turn increase property values in Wedgwood and make it easier to build housing developments. Annexation was a “piecemeal” process by voter precincts. In April 1945 a portion of the Wedgwood area, but only as far north as NE 85th Street, officially came into the City of Seattle. At that time the postal service made the decision that houses north of 85th Street had to have rural-style curbside mailboxes, a system which Wedgwood’s north-of-85th homes still have today. All of the geographical area of the Wedgwood neighborhood (NE 75th to 95th Streets) was included when the city limits were moved again in 1953, but Mr. Cook did not live to see it. Finally in 1954 the Seattle City limit was extended all the way out to NE 145th Street, which included neighborhoods such as Lake City. The storefronts at 7501 35th Ave NE are on Mr. Cook’s property which he sold for development in 1946. When Mr. Cook turned 85 years old he began to scale back into retirement mode. On November 13, 1946, Mr. Cook sold his property at 75th & 35th to a developer, Marinus Halffman, who built the commercial building at 7501 35th Ave NE. The building was constructed in two phases, with expansion westward after Mr. Cook’s house was moved off of the site in 1948. For many years the corner storefront was occupied by View Ridge Pharmacy. 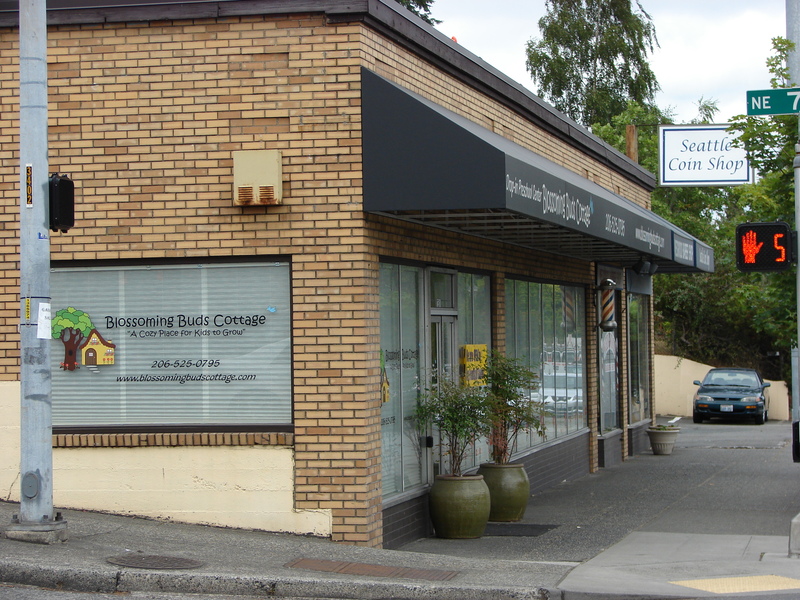 In 2017 the businesses in 7501 35th Avenue NE were Blossoming Buds Cottage Child Care, Wedgwood Barber, and the Seattle Coin Shop. Blossoming Buds closed on November 18, 2017. A Seattle company, Grand Central Bakery, announced that they would open in this corner space in the autumn of 2018. Mr. Cook’s house, though remodelled, still stands where it was moved in 1948, to 7544 32nd Ave NE. Mr. Cook didn’t want to give up his house when he sold the property at the corner of 75th & 35th, so he had his house moved to another site. 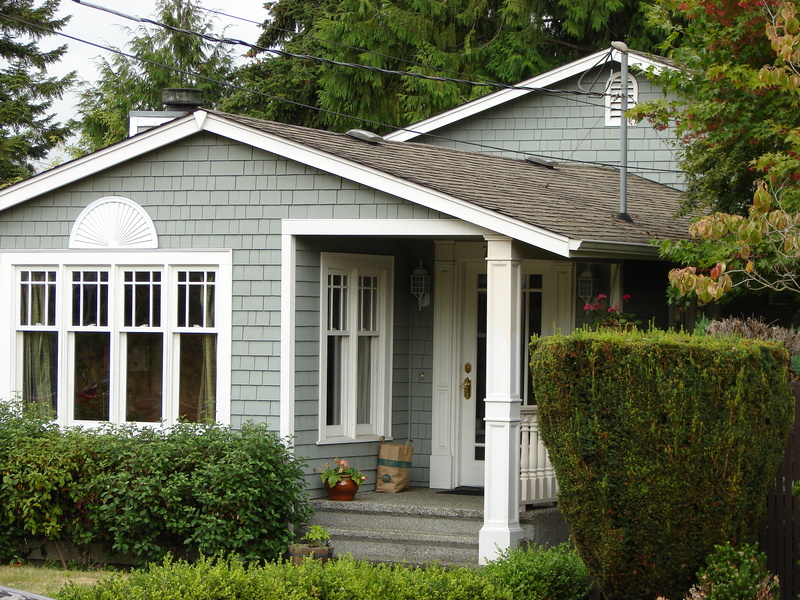 Though it has been remodeled, Mr. Cook’s house still stands today at 7544 32nd Ave NE. Mr. Cook died there in 1951 at the age of 90. From his arrival in young Seattle in 1891 through his contributions to the development of Wedgwood in the years 1920 to 1951, Frank Vickers Cook was part of Seattle’s pioneer history and was an early Wedgwood neighborhood booster. Seattle City Council Bill Number 65101, Ordinance Number 73879, An ordinance relating to and providing for the annexation to the City of portions of Sonora, Ravenna, Sand Point and Ziria Precincts; passed by full Council March 19, 1945. (included Wedgwood up to NE 85th Street only.) Council bills are listed on the website of the Seattle Municipal Archives but the content is on microfiche which can be read in the research room, third floor of City Hall. City directories: Polk’s Seattle City Directory, 1890 to 1951, showing Mr. Cook’s occupation and residence. Accessed at Seattle Municipal Archives, 3rd floor, City Hall, Seattle. The Municipal Archives is on the third floor of City Hall in Seattle. Historical background material/neighborhood development: Early Neighborhood Historic Resources Survey Report and Context Statement by Greg Lange and Thomas Veith, 2005 (revised 2009.) The report is listed as “Residential structures constructed prior to 1906” under context statements, Seattle Dept. of Neighborhoods historic preservation page. “Business and Industry in Seattle in 1900,” Essay #1669 by James R. Warren. “Panic of 1893,” Essay #1972 by Greg Lange. “Seattle doubles in size by annexing north-of-downtown communities on May 3, 1891,” Essay #2214 by Greg Lange. “Seattle annexes the area north of N. 85th Street to N. 145th Street on January 4, 1954,” Essay #7514 by David Wilma. “Annexation asked, engineer mails out petitions.” Seattle Daily Times, Nov 29, 1941, page 3. “Big annexation to City asked.” Seattle Daily Times, August 1, 1944, page 5. “Frank Vickers Cook.” (death notice) Seattle Daily Times, July 3, 1951, page 22. –Property card notation that Mr. Cook’s house was moved from 3412 NE 75th Street to 7544 32nd Ave NE in May 1948. –Deed index shows purchase date Dec 15, 1891, F.V. Cook from E.O. Graves & wife. Deed, Vol. 141 D p. 579, Block 40, State Park Addition. Source: General index to deeds, King County, 1852-1903, Co to Cz. –Deed index shows sale of property Nov 13, 1946, F. Vickers Cook to Marinus Halffman, Lots 6 to 10, State Park Addition. Vol. 2552 D p. 221, General index to deeds, King County, 1946-47, Volume 20. This entry was posted in boundaries, businesses, Houses and tagged 75th & 35th, annexation, city limits, early Wedgwood landowners, moving houses, Neighborhood History, Seattle, Seattle Fire of 1889, WPLongform. Bookmark the permalink.